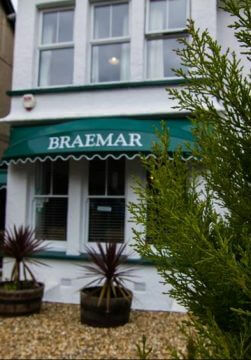 Braemar guesthouse in Falmouth is a substantial house situated a short walk from the centre of town and boasting ample off street parking for all our guests. We offer nine lovely rooms, all recently decorated in a contemporary style. Seven rooms offer en-suite facilities and one of the en-suites is a family room with lounge. Each room is equipped with flat screen TV and has free WIFI. For your refreshment there is a kettle with tea, coffee, hot chocolate and biscuits. Our rooms are available from just £37.50pppn. 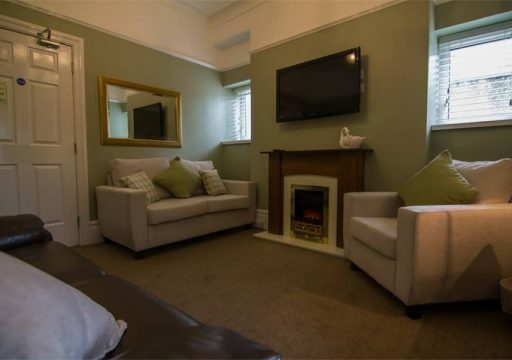 The family suite is available from £80 per night and sleeps up to 6 people. All our prices include breakfast and VAT @ 20% so, with all major credit cards accepted, why not treat yourself to a relaxing break today! For further information on all the facilities on offer please view the website. We truly believe Braemar is in the ideal location for so many different reasons. Firstly, we’re just a 2 minute walk from the famous Gyllyngvase Beach. Secondly we are situated just a few minutes walk from the town centre – its shops, pubs and bistros are all within walking distance. Students and parents will discover we are the perfect place to stop when its interview time. Just over 5 minutes walk is the Woodlane campus of Falmouth University while the Tremough campus is around a 5 mins drive away. We can make sure you have your breakfast nice and early if needs be. If it’s business that brings you to Falmouth then no worries. Our diverse collection of rooms will mean you will feel right at home. And its a great spot central to many south coast/mid Cornwall locations.